The research vessel Callisto cleared the West Quoddy Head lighthouse and I punched a waypoint for Bradford Cove on Grand Manan Island. I was excited when the GPS calculated my distance as a short trip of 11.5 miles. "Nice, we should be there in less than 30 minutes," I shouted to Marianna and Megan over the roar of the 225 horsepower outboard. The Grand Manan Channel (the waterway between Maine and Grand Manan Island), which is notorious for a rough sea state, was like glass and the air was very warm from the late afternoon sun. The trip across the the channel was short and pleasant and we soon approached the shoreline of the southwestern side of Grand Manan. I slowed the Callisto to 8 knots of speed when we were about two miles from Bradford Cove. The original report of a whale in the weir near Bradford Cove had been of a mom trapped inside the weir with a calf on the outskirts. I wanted to approach the surrounding area slowly and with extreme caution in case there was indeed a calf in the area. As we approached the only weir in the area, Marianna began to scan the area using binoculars. Then, almost as if in slow motion, we all sighted the tell-tale sign of the right whale- a strong and very distinctive "V" shaped blow. As we approached the outside of the weir, Marianna and Meagan began shooting photographs and video while I called back to our field station to alert folks that we were indeed confirming the presence of a right whale in the weir. Additionally, I wanted to confirm that it was a single whale in the weir, and was not a known mom for the year. In fact, it turned out the whale was a 25 year-old adult male, Catalog #1708! Releasing a large whale from a weir is a slow process and needs to be done at the right time of day because of the tides. The Grand Manan Research Station was working hard to get in touch with the owner of the weir and to coordinate a response for the following morning. On Sunday morning, the owner of weir organized his crew and set out to see what they could do. 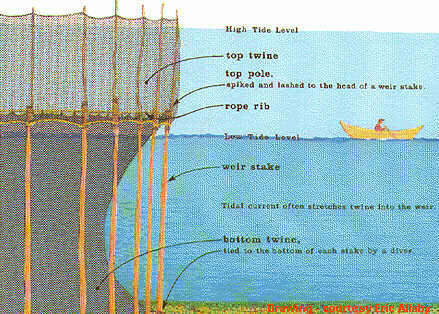 The first step was to take down the top twine and the top poles of the weir (see diagram below). The hope was that as the tide rose at the end of the day, the whale could simply swim out of the weir. But as the evening came and the tide rolled in, the whale remained. A deeper, wider opening would need to be created. The plan for Monday morning was to pull several of the stakes that had been driven into the sea floor to create the permanent framework of the weir, as well as removing the bottom twine, thereby partially disassembling the weir to create a larger opening that the whale would swim through. After a long, difficult morning of pulling eight poles, the whale finally swam out of the weir...in a hurry! The response and safe release of right whale #1708 from the weir was made possible by the hard work, dedication and coordination of many people and groups including the Grand Manan Research Station, Department of Fisheries and Oceans Canada, Campobello Whale Rescue Team and the New England Aquarium Right Whale Team. However, the owner of the weir in particular should be commended for his ability and willingness to partially disassemble his weir for the safe release of a right whale.